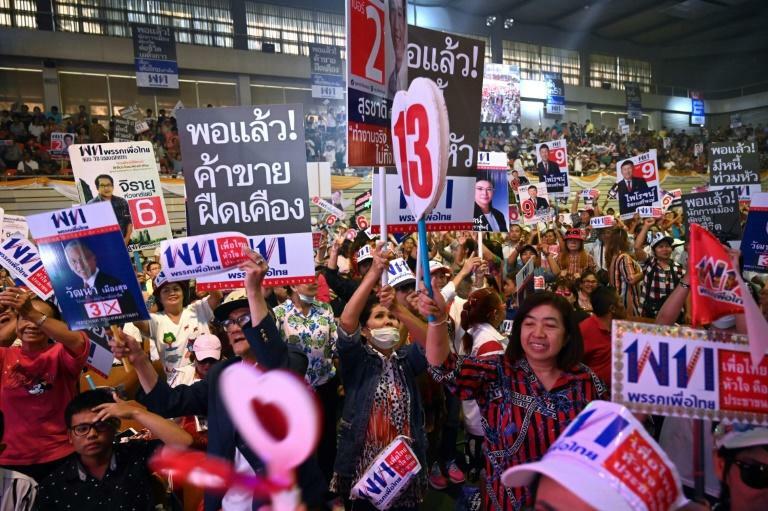 Parties for and against Thailand's junta rallied across Bangkok Friday, as election fever grips the country ahead of the first poll in eight years. The boisterous final push before the March 24 showdown was infused with rarely seen levels of excitement and backlit by symbolism from afar, with the family of ex-premier Thaksin Shinawatra holding a politically star-studded wedding in Hong Kong the same night. 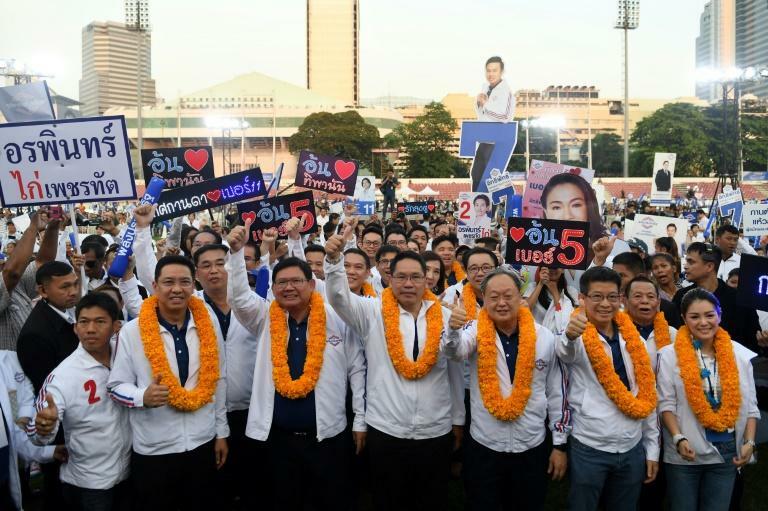 The generals who seized power in 2014 are hoping to hold on through the ballot box with the help of military-appointed senators who can vote for prime minister, and coup leader Prayut Chan-O-Cha made his first appearance at a rally for his Phalang Pracharat party. But he faces several parties linked to the influential Shinawatra family, which has won every election since 2001. Thaksin was ousted in a 2006 coup and his sister Yingluck's administration was toppled by the army in the 2014 power grab. Thailand is broadly divided between pro-Shinawatra factions and an elite aligned with the military, which has portrayed itself as a stabilising force and defender of the country's monarchy. But loyalties are more complex now with more than seven million first-time voters aged 18-25 and new parties in the mix. The most prominent is Future Forward, led by charismatic frontman Thanathorn Juangroongruangkit, a 40-year-old billionaire popular with millennials. Thousands of young Future Forward supporters decked out in the country's trademark orange colours waved flags and glow sticks at a stadium in Bangkok Friday night ahead of Thanathorn's appearance, as their hero prepped backstage. "You win the ideas first and then you win the war and then you can change," Thanathorn told reporters before his speech. Political buzz galvanised multiple rallies across the Thai capital as the sun went down. Even the famously gruff Prayut, the army man who led the 2014 putsch, took to the stage in Bangkok. Wearing a white shirt and slacks and holding roses, he ascended the stage and spoke for about five minutes, jabbing his finger to punctuate points. "Thank you for all the support given me, I will give back with my life and my heart," he said. But it remains to be seen whether his Phalang Pracharat can make a dent in the electoral machine of Pheu Thai, the Thaksin-affiliated party that still taps loyalty from the poor but populous rural north and northeast. "They are strong with all people," said Sharpay Janperng, 26, manager at an education company, at a packed rally for the party. Pheu Thai's top candidate for prime minister, Sudarat Keyuraphan, told the crowd that "happiness and a good economy depend on your pen." Future Forward and Pheu Thai, whose rallies were held 100 metres apart, both oppose the junta. But pro-democracy forces need to overcome the built-in advantage of the 250 appointed senators. That means Phalang Pracharat and other military-aligned parties need only 126 votes in the 500-seat Lower House to elect a prime minister. In a thinly veiled jibe at the stacked deck, Thai hip-hop sensation Rap Against Dictatorship, whose last anti-junta song racked up nearly 60 million views on YouTube, named their next release "250 sycophants". By contrast, Pheu Thai would need to cobble together 376 votes to gain the upper hand. That raises the prospect of a long road ahead of political horsetrading after preliminary results are announced Sunday night. Analysts believe the loyalties of Bhumjaithai, which finished third in 2011 and is run by the fantastically wealthy Anutin Charnvirakul, will be in high demand. Anutin said Friday his party would support a "stability" government but is leaving his options open. Thaksin, a billionaire telecoms mogul, has been in self-exile since 2008 to avoid a jail term on corruption charges. But he still sits at the heart of Thailand's politics. Earlier this month the dissolution of one of his parties -- Thai Raksa Chart -- hampered an election strategy to cobble together votes under a party list system. Thai Raksa Chart had proposed Princess Ubolratana as its candidate for premier, but King Maha Vajiralongkorn struck down the move calling it "highly inappropriate". Ubolratana was seen at Thaksin's daughter's wedding in Hong Kong on Friday night. When reporters asked him who will win the election as he arrived at the luxury hotel, Thaksin replied: "I don't know."